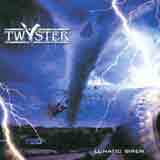 Twyster is a German band playing melodic hard rock with female vocals. The music is very similar in style to Euro hard rock acts such as Bonfire, Pretty Maids, and PC69. Twyster makes no attempt to bring anything new to the scene which is not so much a problem as long as you among the best in what you do. After several listens to this album, I feel that it is well done melodic hard rock, but nothing stands out to separate the band from the rest of the "average" pack of hard rock bands. Simply put, when I am in the mood for melodic hard rock, I would likely reach for a CD from one of the aforementioned bands before I reached for this CD. The music has a distinct melodic quality complete with thick harmony vocals, but most of the time they are not strong enough to stick in your mind immediately. The album is well produced and the sound is crystal clear, but somehow the music lacks that certain "punch" that keeps me coming back. This is the type of release in which there are no weak aspects of the sound, but there aren't any highlights either. The guitar sound is crisp and at the forefront of the sound, but there isn't a riff or solo to be found that will knock your socks off. The songs are melodic, but there are only one or two memorable moments that stick with you. The rhythm section does a good job, but nothing special as the drumming becomes fairly predictable after a few tracks. All in all, this isn't a bad release, but it's just too average sounding for me. This type of music has been played by many bands in the past in much more memorable fashion. From prouction to musicianship to melodic quality, each aspect of this album is very satisfactory, but no aspect of the music could be considered top notch. This is the type of album I listen to a couple of times and am satisfied, but is easily forgotten. If the band can push their creative buttons a little bit harder in the future, they will certainly demand more interest.